CP/CENT/INT/06/01. 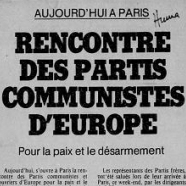 Paris Conference of European Communist and Workers' Parties on Peace and Disarmament, April 1980:- CPGB EC correspondence with CPGB branches about the decision not to participate. Created 1980. CP/CENT/INT/06/02. Paris Conference of European Communist and Workers' Parties on Peace and Disarmament, April 1980. CPGB EC and PC materials, including correspondence with the PCF, PUWP; draft and adopted documents of the CPGB EC, notes by Jack Woddis, Chris Myant, Gordon McLennan and Tony Chater; correspondence and documents from other European CPs, etc. Created 1980. CP/CENT/INT/06/03. Paris Conference of European Communist and Workers' Parties on Peace and Disarmament, April 1980. Press coverage of the conference, including in Soviet/TASS press dispatches, L'Humanit�, Unity, Morning Star, other communist and non-communist publications. Created 1980. CP/CENT/INT/06/04. Conference organised by the USSR Academy of Sciences' Institute of the International Working Class Movement on "The Working Class and the Contemporary World", Moscow, October 1986. Report of CPGB delegates to CPGB PC, speeches by Gerry Pocock and Pete Carter, CPGB background paper, correspondence with the USSR Academy of Sciences and the CC CPSU, some other conference papers and drafts/notes for the CPGB contributions. Created 1986. CP/CENT/INT/06/06. Preliminary conferences to prepare for the conference of 29 European Communist Parties held in Berlin in 1976. Record of speeches at the Consultative Meeting of Communist and Workers' Parties of Europe, Warsaw, October 16-18 1974, and papers of the Preliminary Meeting of Communist and Workers' Parties of Europe, Budapest, December 19-21, 1974, preliminary draft of the conference declaration. Created 1974.